Too often the doctrine of creation has been made to serve limited or pointless ends, like the well-worn arguments between science and faith over the question of human and cosmic origins. Given this history, some might be tempted to ignore the theology of creation, thinking it has nothing new or substantive to say. They would be wrong. In this stimulating volume, Ian A. McFarland shows that at the heart of the doctrine of creation lies an essential truth about humanity: we are completely dependent on God. Apart from this realization, little else about us makes sense. McFarland demonstrates that this radical dependence is a consequence of the doctrine of creatio ex nihilo, creation from nothing. Taking up the theological consequences of creation-theodicy and Providence-the author provides a detailed and innovative constructive theology of creation. Drawing on the biblical text, classical sources, and contemporary thought, From Nothing proves that a robust theology of creation is a necessary correlate to the Christian confession of redemption in Jesus Christ. Click here to view the Table of Contents and Preface. "McFarland's monograph is arguably the most serious retrieval of the doctrine of creation ex nihilo in recent systematic theology. He successfully dispels the accusation that the doctrine necessarily implies an arbitrary God and convincingly argues, through Christological refocusing, that this key affirmation of Christian faith proclaims how the Creator is 'not only inexhaustibly rich in God's self, but also endlessly profligate in sharing this divine plenitude with creatures.' Through careful rereading of biblical texts and lively conversation with patristic and other sources from the Christian tradition, we are treated to a fresh and incisive analysis of divine transcendence, freedom, providence, and love for the contingent, created 'other.'" "Ian McFarland has produced one of the most substantial contributions in recent times to the theology of creation. Rooted in Scripture and church tradition, yet always alert to contemporary challenges, his study offers an important defense of the classical ex nihilo doctrine. By describing its vital function for Christian thought and action, he shows how it is not a quasi-scientific hypothesis but an essential part of an account of the ways in which all creatures are sustained and loved by God." "Acknowledging forthrightly both the exegetical and philosophical problems posed by the church's doctrine of creation from nothing, this well researched and cogently argued study makes an impressive case for why faith in the trustworthiness of the triune God who creates all things in Christ may be shown to provide a deeper understanding of what creation entails than either its ancient or recent alternatives. Once again McFarland has demonstrated how a first rate critical engagement with the sources of Christian doctrinal traditions can constructively address some of today's most vital issues." "Ian McFarland's From Nothing engages the fundamental importance of the idea of creation for faithful living and thinking. 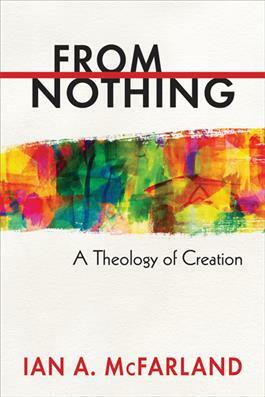 God creates from nothing; Ian McFarland constructs theology of creation out of a rich mix of conversations with Scripture, the history of Christian thought, debates about science and theology, and an ecumenical chorus of theological voices. McFarland's superb theological craftsmanship always keeps the book clear, engaging, and wonderfully illuminating."